After you wear your dentures for a couple of years, your gums begin to change and shrink, causing the dentures to not fit as snugly as they once did. The best way to solve the problem is to take a new impression of your gums, and reline the dentures so that they fit again. After another couple of years, however, your gums will shrink again and even the relining material won’t help the dentures fit any tighter. According to Family Gentle Dental Care, you should reline your dentures every two years. 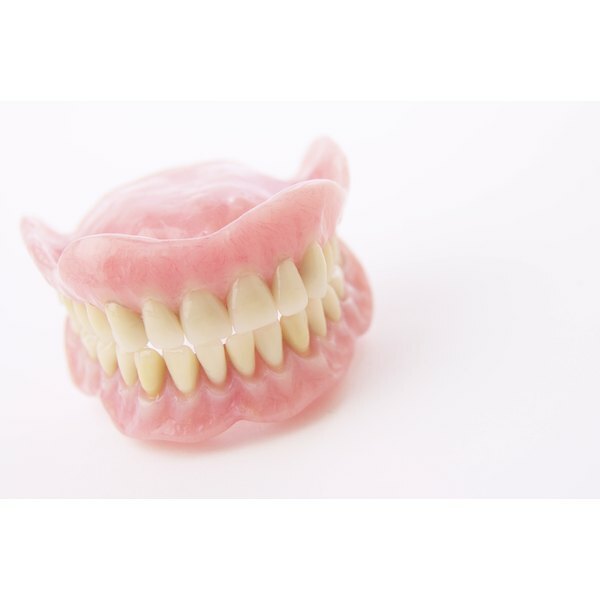 You can remove the old acrylic denture relining yourself. Fill a small bowl with hot, soapy water. Place your denture in the bowl, and let it soak for two hours. Take a spoon and scrape off the acrylic denture reline material. Be careful not to scrape so far down that you scrape the actual denture. Don't scrape in a back and forth motion, but scrape only in one direction. Soak the denture in mouthwash to remove any soapy taste and loosen any leftover acrylic relining material. Rinse the denture under warm running water. According to DoctorSpiller.com, to clean your dentures after scraping the reline material out, soak them in warm water and laundry detergent overnight. Use one tbsp. of bleach in six to eight oz. of water. If the hot, soapy water doesn’t loosen the reline material enough for you to scrape it off with the spoon, use a hair dryer set to a warm setting to try to soften the material enough for you to remove it.